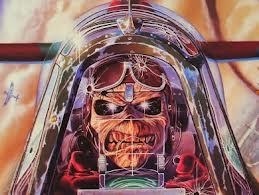 Bruce Dickinson lead Singer with fantastically noisy Heavy Metal Band Iron Maiden was born August 7 1958 in Worksop Nottinghamshire, Dickinson started school at Manton Primary in Worksop while his parents moved away to Sheffield. Soon afterwards, when he was six, he was also despatched to Sheffield,where he attended a primary school in Manor Top. six months, his parents decided to move him to a small private school called Sharrow Vale Junior. Dickinson also has a younger sister, professional showjumper Helena Stormanns, who was born in 1963. Dickinson’s first musical experience was dancing in his grandparents’ front room to Chubby Checker’s “The Twist”, when he still lived with them in Worksop.The first record Dickinson recalls owning was The Beatles single “She Loves You”, which he managed to persuade his grandfather to buy him, which made him more interested in music.He tried to play an acoustic guitar belonging to his father, but it blistered his fingers. Outside his career in music, Dickinson is well known for his wide variety of other pursuits. Most notably, he undertook a career as a commercial pilot for Astraeus Airlines, which led to a number of media-reported ventures such as captaining Iron Maiden’s converted Boeing 757 (Ed Force One) during their world tours. Following Astraeus’ closure, he created his own aircraft maintenance and pilot training company in 2012, Cardiff Aviation. Dickinson presented his own radio show on BBC Radio 6 Music from 2002–2010, and has also hosted television documentaries, authored novels and film scripts, created a successful beer with Robinsons Brewery and competed at fencing internationally. Chris Foreman, the guitarist with ska band Madness, was born 8 August 1956, London. nicknamed ‘Chrissy Boy’, Foreman started Madness with Mike Barson and Lee Thompson in 1976. Foreman was one of the group’s main songwriters, mostly writing music with other members, usually Suggs or Lee Thompson, providing the lyrics. After Madness disbanded in 1986 he formed a new band The Madness with Thompson, Suggs and Chas Smash but they broke up after releasing one album. Then he, alongside Thompson, created another group called The Nutty Boys with Thompson on lead vocals. They released an album called Crunch! in 1990. The band are now known as Crunch!, and play in London every couple of years. Foreman began using a mobile phone attached to his guitar to record short videos from his position on stage during live Madness performances to provide fans with a unique perspective from the “guitar’s eye view”. He coined the term “Axecam” to describe this filming technique. By December 2008, he had acquired a higher quality digital video camera which he attached to the shoulder strap of his guitar using an “Axecam holder”, crafted by a member of the stage crew just before Madness went on stage at the O2 Arena on 19 December 2008. The new “Axecam” produced a far more stable picture and Foreman posted the first video from this performance (“It Must Be Love”) to the MadnessStudio2008 Channel on YouTube on 20 December 2008.Foreman also maintains a series of videos made with the Axecam entitled “Chrissy Boy Meets And Greets…”, in which he meets famous people that have either appeared alongside Madness at festivals, or that have attended awards ceremonies with Madness. The video is normally a close up of the famous person’s face, with Foreman out of shot, and usually consists of a few spoken words, and perhaps a joke or humorous reference from Foreman to the star’s career. Each clip is normally less than ten seconds long. Stars featured have included: Dizzee Rascal, Al Murray, Plan B, Alex James, Graham Coxon and Damon Albarn, former Madness singer/drummer/manager John Hasler, all 6 members of the reformed Specials, ex-Bodysnatcher and Madness collaborator Rhoda Dakar, Martin Freeman,Eamonn Holmes, Jeremy Clarkson, Lulu, and Peter Andre, as well as an Elvis Presley lookalike security guard from Australia.